We are surrounded by data and very close to being overwhelmed by it. The desire to retain data for years, if not decades or longer, so that it might be leveraged in the future (perhaps even tomorrow), is not new. It is the scope and volume of data that is new and the scale to which archived data is being used that brings us to ask again what has become the proverbial question in data centers around the world: Where should I put it? Today, there are more choices than before, but the decision process to answering that question only has two dimensions, all other things generally being equal: time and money. Time primarily is about both duration (how long you want to keep it) and retrieval speed (how fast do you need to access it). Money is about paying the least amount (on a continuing basis) per unit of storage (think about terabytes, because that is something sufficiently tangible to which you probably can relate), as long as the business requirements are being met. The latter is mostly about retrieval speed –the quicker you want it, the more it is going to cost. Answering the where-to-put-it question is valid only for a given point in time. Beyond a short period (think three-to-six years), we are challenged to predict what storage technologies will be available and economically viable. Fortunately, the need is front and center now and not deferrable until later – because there is much that has to be preserved today. So we need to look at what is available today, and extrapolate that a little into the future while making some important assumptions. For those readers who just want a quick answer, we found that for archiving, disk-based storage solutions are, on average, more than six times more costly per terabyte stored than ones based on tape libraries, as shown in Exhibit 1. Explanations and insight require more details and discussions, which follow. Please read on. In 2010 and 2013, a 22-year old computer industry analyst firm and publisher of this report , addressed the economic challenges of storing archived data. This year, that same group has self-funded another study (herein called the 2015 Archiving TCO Study ), with some variations from what had been done previously, as will be explained. This report describes the findings and methods of this third-generation total-cost-of-ownership (TCO) study comparing disk and tape as the major targets for storing many petabytes, or maybe even exabytes, of data for the long term. It is important that you focus on this study and its results and not try to compare them too closely to the prior two studies, because enough has changed in our TCO model to make that problematic, especially if you choose to project our findings into the future. WWhat went into the TCO calculation? In addition to the acquisition cost of the required hardware, we included the cost of maintenance, floor space, energy, and media. Everything was calculated based upon vendor list price, except for the tape media which has broader availability from a number of sources. Tape cartridges were priced slightly above where we estimated the street price to be. It should be noted that disk solutions typically come with a three-year maintenance and support warranty, although some vendors included a six-year warranty with an adjusted price. Tape libraries typically carry a one-year warranty, with paid annual maintenance contracts after that. In the past, many pundits have claimed that “Tape is Dead”. Well, years later, tape continues to thrive and reach new capacity and performance milestones . Now, some are ready to declare that “Disk is Dead” (referring to traditional rotating disks) , as the cost of solid - state storage (such as in SSDs) appears on a downward trend, while the growth in the capacity of rotating disk drives seems to be slowing. However, we suspect that disk also will continue to improve in the years ahead (at least in the near future), though it is not clear by what technological methods nor exactly at what rate of capacity growth . As a result of neither being dead , this year we continue to focus on both tape and disk as the primary storage infrastructure for today’s long-term archiving solution. Why Limit This Study to Just Disk and Tape? In this archiving study, we are looking at the long-term preservation of data stored as files ( and, indirectly, as objects ) and need to do this at the lowest possible cost that will accomplish our archiving objectives. Remember, that we’re talking about archived data. The urgency to retrieve immediately the vast preponderance of archived data tends to be much less than with transactional data. This is exactly why we have determined that today disks and tape are required for archiving and SSDs are not. IIn fact , in our TCO model we presume that only 15% of the growing collection of archived data will be touched in any given year. Saving about 84% of the cost of using disk (by using a tape library solution as the target archiving media ) usually makes a lot of sense (especially for the archived data not being retrieved) unless there is a critical need requiring near - instantaneous delivery of the requested data. What has Changed, in Terms of the Underlying Storage Technologies? In general terms, disk and tape technologies are much improved (in terms of capacity per disk or per tape cartridge and costs per terabyte) than in the beginning of 2013, when we did the previous study, although there is a notable exception, as will be explained shortly . We looked at the many costs of storing a lot of data on rotating disk infrastructure and in tape libraries. OOur fundamental expectation has not changed (from the two prior studies) most larger enterprises almost certainly still will need a mix of both disk and tape infrastructure for their archiving solutions – and certainly this will be true for the next three years. 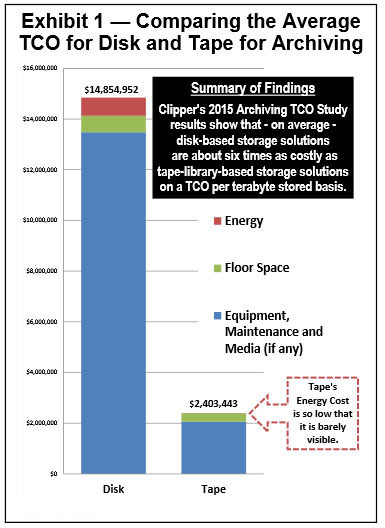 The bottom line of the 2015 Archiving TCO Study is the same as in our earlier studies and should not come as a surprise disk based archiving solutions cost a lot more than tape library solutions - more than six times as much as tape ( based on the TCO per terabyte stored) – 6.18 times to be exact. Thus, tape library-based archiving still costs significantly less per terabyte to store data than with rotating disks. As before, disk-based solutions typically still are much faster at retrieving modest amounts of data than when using tape in a tape library. While not directly comparable, in our 2013 study this was about 26 :1. There are many reasons for this narrowing, but the largest factor is that Ultrium tape-based library solutions today are using the same LTO-6 drives and cartridges as when the study was done in 2013 two years ago . Even with this narrowing of tape’s TCO advantage, there continues to be a significant economic justification for tape (measured in millions of dollars) , as long as the business use cases can tolerate a retrieval time that usually will be measured in many seconds to a couple of minutes rather than fractions of a second to maybe a few seconds that disks would deliver. In summary, the question is not “tape or disk”, but when to use tape and when to use disk, on the assumption that it is very likely that you will use both for archiving, driven largely by your enterprise’s time and money parameters. What you care about is the 6 :1 ratio of the average TCO of disk divided by the average TCO of tape. Be careful not to jump to conclusions, because the timing of this study (with respect to the announcements of next generation of disk and tape storage devices ) was an important factor in the results.